The below artworks are the most important by Julio González - that both overview the major creative periods, and highlight the greatest achievements by the artist. Artwork description & Analysis: Gonzalez depicts the introspective mood of a young woman through the way her head leans forward, her calm facial expression, and her closed eyes. He draws upon his technical expertise in repoussé in these early small busts. 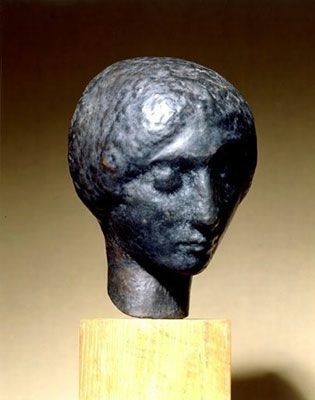 This metalworking technique allowed for greater plasticity, as can be seen in the shape of the woman's head, an enclosed globe, the soft modeling of her face, the texture of her hair. The palpable sense of form not only anticipates his abstract, cubist heads of the 1930s, it also evokes Rodin's emphasis on corporeality. Gonzalez thus took his first step towards dissolving the fully plastic round volume into geometric form. He would rely more and more on the viewer's perception to associate the abstracted forms, a globe (head) and cylinder (neck), surfaces and lines, as referencing the head, face, or figure of a woman. Yet parallel to Rodin, Gonzalez reveals his process of making. He leaves exposed the marks of beating the metal sheets into the shape of the head to capture a simple human moment, a young woman lost in thought. Artwork description & Analysis: In this small sculpture, only 7 1/2 inches long, a couple reclines, embracing each other. Yet, these figures are essentially abstract forms. It is the sense of interlocking and enclosed spaces rather than volume that contribute a human quality to these forms. The linear and geometric surfaces of the welded unmodified scrap iron pieces make apparent the influence of Cubism; the way scrap iron bars become arms and legs, flat slabs become the torso. The stylized heads reflect Gonzalez's fascination with the Etruscan couple reclining on a sarcophagus that he studied in visits to the Louvre. The influence of Luca Cambiaso, an Italian 16th-century artist who often sketched human figures geometrically, reducing them to cube forms, can also be seen in the work. The spatial construction of line and surfaces create a feeling that these two figures, this couple, are not only welded together physically, but emotionally. At the time he created The Couple, the artist also made a similar sculpture of a woman alone, a work that was purchased by the American painter and art dealer, John Graham. 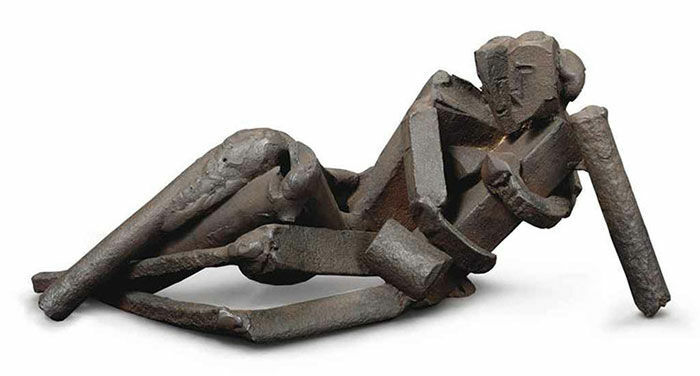 Graham was a friend of David Smith, the American sculptor whose first works of forged sculpture in 1933 included a figure based upon González's reclining woman. 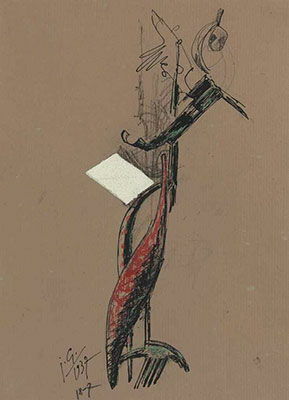 Artwork description & Analysis: From a series of approximately ten drawings, this collage-drawing depicts a female figure with red spiraling curved legs that connect to a penciled skeletal torso supported by a thick inked black line that rises and contracts into a thin line to intersect with a sketched winged right arm. The figure's left arm is delicately hinged and held in place by a line extending out to suggest a shoulder. This same line defines the curve of the neck that ends in a circle for the head with two black dots for eyes. The left arm extends forward in a bold gesture, underscored by its wide, black and green curving shape. At its extremity, a hand seems to curve upward in the gesture of holding something. A white rectangular paper, symbolizing a mirror, hovers near the left hand. This drawing of a woman and mirror comes closest to the sculpture he welded in iron of the same name. Gonzalez's sketches of a woman and mirror show how the artist continuously drew from his experience of reality, continuously putting his ideas on paper and then, realizing them in abstract sculptural forms. In contrast to his sculptures, Gonzalez's drawings can be seen as a "visual diary," according to the art historian Valerie Fletcher. The drawings are "the sensitive barometer of Julio Gonzalez's way of thinking," as the art historian Josephine Whiters has commented. Gonzalez precisely dated most of his drawings with day, month, and year, unlike his sculptures that he left undated. In general, these studies in color only present visual exercises that have a tangential relation to the realized sculptures. They serve instead as a laboratory for Gonzalez's creativity, especially during the onset of the second World War when welding became impossible due to the scarcity of materials and supplies. Artwork description & Analysis: In this work two curving pieces of metal, one with a foot like extension with five toes reaching back, rise into a long slab of metal that lifts to a round metal circle on the right and a rectangular metal box on the left. This ensemble of curved lines and surfaces articulates Gonzalez's practice of interrelating his drawing and sculpting (welding). His work in the mid-1930s became strikingly abstract and remarkably open, as welding allowed his metal sheets and rods to be like lines drawn in the air. From the beginning, much of González's work focused on the female figure. As the art critic Hilton Kramer wrote, "All of the motifs to be found in the great open-form sculptures that he produced in the 1930's - heads, dancers, women combing their hair, looking in mirrors - are not only representational but altogether traditional." The artist also seems to have had traditional views of women - as objects of beauty, as mothers, or, as this work shows, as sexually aggressive. The viewer has to piece the figure together visually to see the archetypal femme fatale represented with a mirror: perhaps, two curving legs, a foot arched with extended toes, a plate of iron for her torso, a bar for her neck. Using only figurative references, the work schematically depicts a woman preoccupied with her beauty and charm. 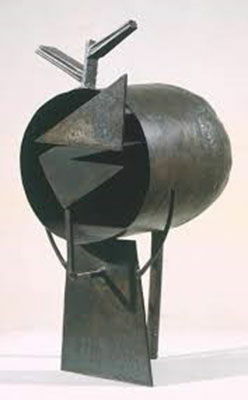 Artwork description & Analysis: This sculpture is made of a cylinder resting upon a trapezium to which it is connected by thin curving bars on both sides. Another thicker bar of metal connects the base of the trapezium to the base of the cylinder. Steel triangles are suspended in the opening of the cylinder, and a bar with two angular arms rises out of the top. 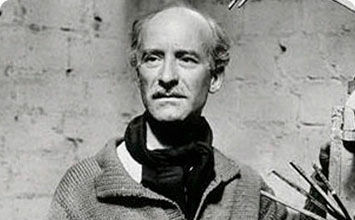 It reveals Gonzalez's artistic maturity, resulting from his two year collaboration with Picasso (1929-30). From his earliest works, González primarily focused on the human figure, yet in this work, only the title definitively indicates that we are meant to see, a human head. Working in steel let him create a three-dimensional form without needing to fill its volumes, as he said, "drawing in space." Space makes the head into a tunnel, where the suspended triangles suggesting facial features almost resemble weather vanes, a visual humor reinforced by the bar at the top like a lightning rod disguised as a hat. Though not part of the Surrealist movement, the artist sometimes showed at Surrealist venues and felt an affinity for their visual puns. Like the Surrealists, he understood that used, everyday objects and materials could offer more expressive qualities to a work, once separated from their utility. The juxtaposition of different materials and objects in unreal and strange connections opened up the possibility of creative expression in contradiction to the predictable modern mechanized world. González worked the found material: forming, cutting, designing, and bending it, before collaging it into the figure. The small curved bars could suggest arms, as if the figure were holding its head in both hands. What is conveyed is a kind of hollow modern sensibility, filled only with the changing winds of public opinion. The human is no longer recognizably human, but functional. As art historian Jörn Merkert commented, "All damaged and injured are kept - scrap remains scrap - and at the same time González gives a special validity back to this injured material of the everyday and working world." The facial features, like the suspended triangles, are an abstract construction of surfaces and lines, yet suggest human fragility in their precarious construction. 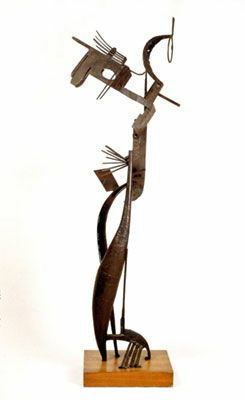 Artwork description & Analysis: This significant sculpture depicts a peasant woman, holding a child in her left arm, and a sickle, a traditional agricultural tool, in her right hand, as she steps forward resolutely on the wooden base and looks up toward the sky. This modern madonna and child references the Madonna - the "Black Madonna" at the Monastery of Saint Montserrat - as well as the Catholic faith at the heart of Spanish culture. The life-sized sculpture is uncharacteristically naturalistic, and reminiscent of Gonzalez's oil painting, Peasant Woman Sitting (1919-1920) that depicted a peasant woman in similar dress and holding a sickle. The title of the piece refers to the Montserrat mountains near Barcelona, a traditional symbol of the artist's native province of Catalonia, and is also a common name given to women from the area. The sickle was a symbol used in the Revolution of 1936, at the onset of the Spanish Civil War, when the province defeated the Spanish Nationalist rebels who attempted to overthrow the left-wing Popular Front Spanish government. At the 1937 Paris World Fair, the work made a powerful statement, exhibited alongside Picasso's Guernica, created in response to the bombing of Guernica, a Basque country village in northern Spain, by warplanes of the Spanish Nationalist rebels' allies, Nazi Germany and Fascist Italy. 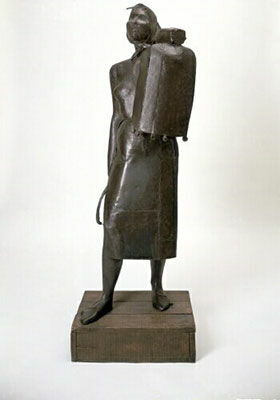 González's representation of a defiant motherhood conveyed his anguish over the Spanish Civil War, which led him to create a monumental figure as a heroic symbol. Cutting, and then welding together pieces of sheet metal, he depicts an ideal woman in naturalistic form. Further, it almost seems the woman is a classic warrior, with shield and sword. She is identifiably a Catalan peasant woman, but the resulting volumes, the child depicted by the cylinder of its blanket, and the lack of detail, make her the archetypal mother of the country. 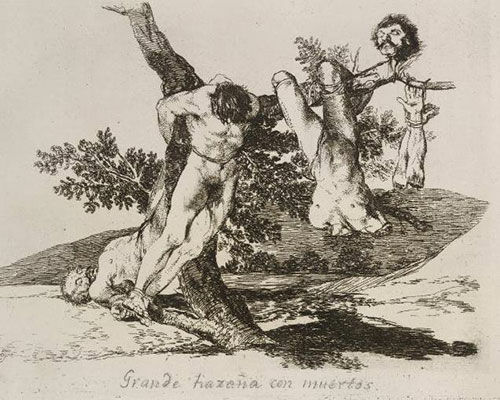 González revisited the figure in later works. 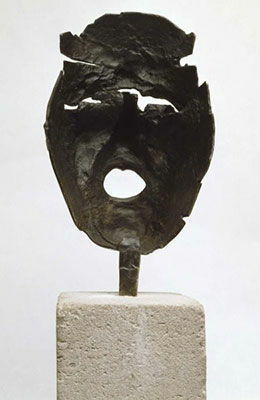 Artwork description & Analysis: In this work, made out of scrap metal, a dark mask with its eyes formed by ragged openings and its edges torn opens its mouth in a scream that captures the universal expression of despair and anguish in the face of a duplicitous and unjust civil war. González's work meant that it could be assimilated into very different art movements but not defined within any of them. His mask evokes the Expressionist artist Edvard Munch's The Scream and the artist Francisco Goya's The Disasters of War series, and yet spoke to his contemporaries in the art movement of Constructivism and abstract art. Having learned how to weld in an armament factory, he knew well how iron is commonly turned into weaponry and said, "It is time this metal ceased to be a murderer...Today the door is wide open for this material to be, at last forged and hammered by the peaceful hands of an artist." Here he revisits La Montserrat as his heroic peasant becomes a broken face expressing the anguish of the Spanish Civil War. Creating the piece directly at the forge, he used a torch to create the mask's surface texture, which is blackened and cracked by fire, to convey how humanity is broken down by war, much like a fragment left over from an explosion. Artwork description & Analysis: This sculpture depicts a humanoid figure with cactus-like legs, a five-fingered arm rising vertically from the hip, and a tubular torso rising to a hat-like head. The left arm is a kind of drum with five fingers above a horizontal phallic bar. 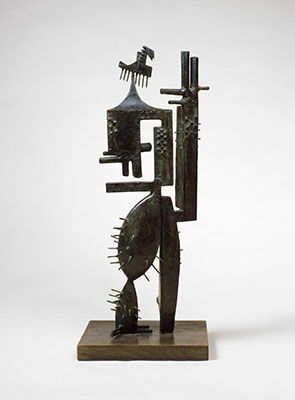 Metal nails erupt from the figure, like cactus spines, influenced, perhaps by the use of nails in Picasso's 1926 Guitar. This defiant, prickly figure symbolizes the republican cause during the Spanish Civil War. 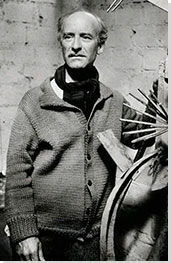 His subsequent work Cactus Man II, sometimes called "Madame" Cactus, personifies the Catalonian peasant's resistance to Franco's fascist threat. At the time both pieces were conceived, Catalonia was under attack by Franco and his fascist Nationalist rebels, and, by the time both were finished, Barcelona had been defeated. During the late 1930s, González's work in the abstract style, like Cactus Man I, had a major influence on avant-garde sculpture. The human figure is synthesized with the cactus to connect the Spanish peasant with the land. Like the cactus, the peasant has the ability to survive harsh conditions and to protect himself. With a sense of humor, the nails resemble both cactus spines and whiskers, and the tiny head is quixotic. The short tubular fingers look like gun barrels, and both the arm rising vertically and the drum on the left resemble machine gun housing, so that the figure seems both armed and armored. In some preliminary drawings, the artist depicted the figure as screaming, but in this finished work he conveys a presence of unyielding resistance. Artwork description & Analysis: From April 1941 to May 1941, the artist completed eight drawings of a woman with a veil of which this is the last. The first drawings were more realistic in style, but the later works, as shown here, are agonized and distorted and influenced by Cubism and African masks. 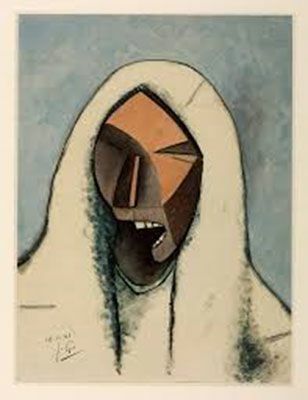 Originally wanting to depict the Virgin Mary, he creates a figure, shrouded in white, the color of mourning, to evoke her as suffering the anguish of humanity during World War II. In its focus on a scream, the work revisits The Screaming Head of Montserrat, but the Cubist treatment emphasizes an element of outrage. Divided into light and dark planes, the face suggests a sensibility torn into pieces by conflict, and the mouth depicted in profile seems to shout into the darkest area in the drawing, as if to denounce the impending darkness that would engulf Spain. First published on 21 Aug 2017. Updated and modified regularly.